Wn Nz365 Le Grand Marsac, K.V.U. Gruppe St-Nazaire'C2', K.V.Gruppe Loire. 1 x Fl241 Command post for AA. Plan of a Flak batterie. The track passing the Fl241 Command post and onward to Nz364 Battr.Drache I: 5./Ma.F.L.A.703. The tower with defensive gun embrasures around the sides. A nice slot or a machine gun. I think the square holes are close combat windows. They would allow light to the stairwell and in times of danger a steel shutter may have closed them off?? 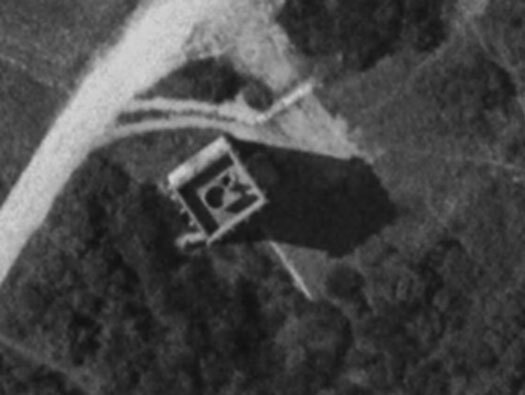 Looking into another Flak tower , this one has a metal ladder on others concrete stairs. Showing more windows up this side. Looking down to the main command entrance. A large command room in the centre with numerous rooms for general purposes as latrines , cooling, fuel, water tank and close combat protecting the entrance. 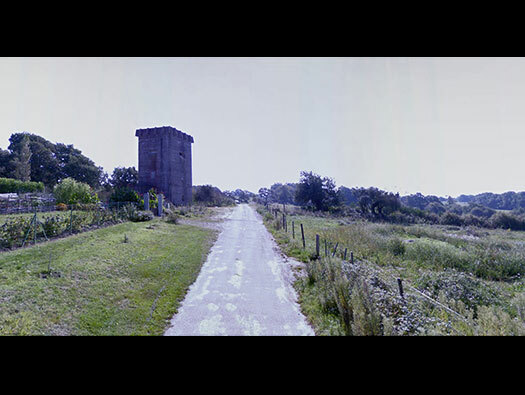 This shows the command room on the right with close combat defence and a stair well up to the tower. This tower could be any height needed for good observation. Entrance and close combat embrasure with tower. Inside a large control room where all aspects of fighting heavy bombers trying to blast away the U-Boat pens in the docks. From command and control of the batteries of 12.5cm guns to the re supply of ammunition, fuel for the generators to power all the equipment and also to manage the Luftwaffe personnel to man the guns, the range finder on the tower and to run the map table. 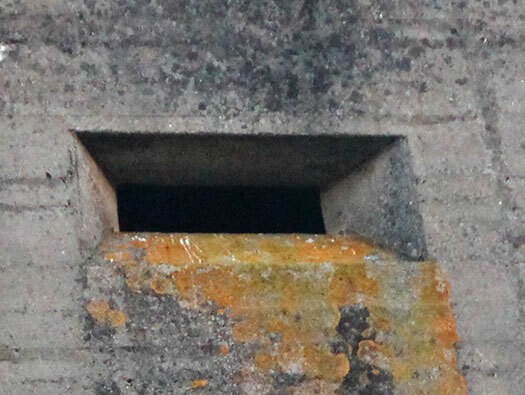 A close up of the entrance and close combat embrasure. Note the black bitumen paint to protect the bunker when earth is banked up against the wall to stop the ingress of water. Inside a Flak control room. Plan of a Close combat layout. Wasser tank. There was a room to the right which was for the storage of water tanks like this one, a standardized tank used by the German army. Looking through the second close combat embrasure at what looks like the ventilation room where hand air pumps can filter the outside air from gas and pressurise the bunker so more gas cannot enter. An advert for the gas pumps. An out of focus aerial slot. I have noticed that many of these aerial slots have no fittings but every now and then you find an earthing strip. I feel that the ones with earthing strip left in place actually had aerials fitted and those without did not. An aerial in its slot. Plan of a bunker aerial. USAAF B17 bomber stream flying very high with condensation trails showing. RAF Stirling bombers visited the U-boat pens on numerous occasions. The tower from above showing two circles, a large one for the range finder and the small second one was for a height finder. 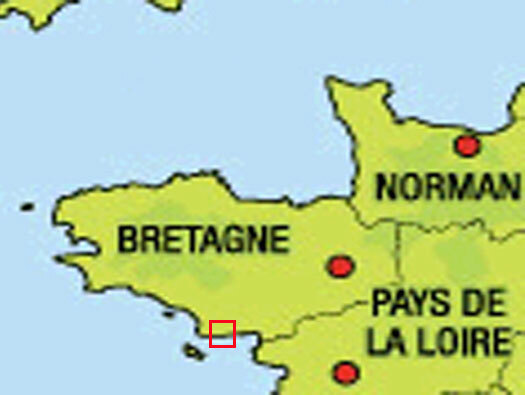 All the information from here and the information from radars around the area would be brought together and orders would be sent out to it batterie like Nz364 Bttr.Drache I: 5./Ma.F.L.A.703. High level Flak, the guns are 12.5cm a very powerful and heavy shell which when it burst would throw out hundreds of pieces of sharp metal that could just cut its way through an aluminum skis of an airplane.